I am very blessed. 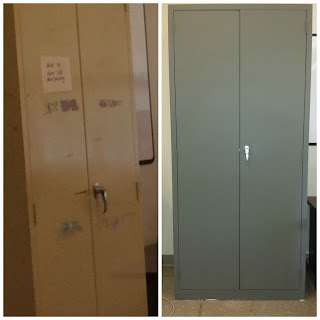 Last year, my classroom was a former storage closet with questionable ventilation. This year I have a new classroom. It's not a full sized classroom, which I'm glad about (it would have been very difficult to decorate). 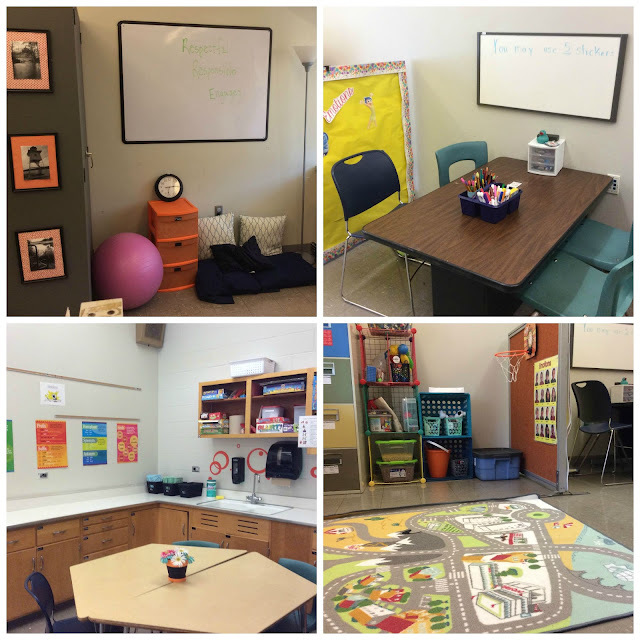 Starting this summer, I began to go into my new classroom for a couple hours at a time to work on creating a fantastic space for my students. 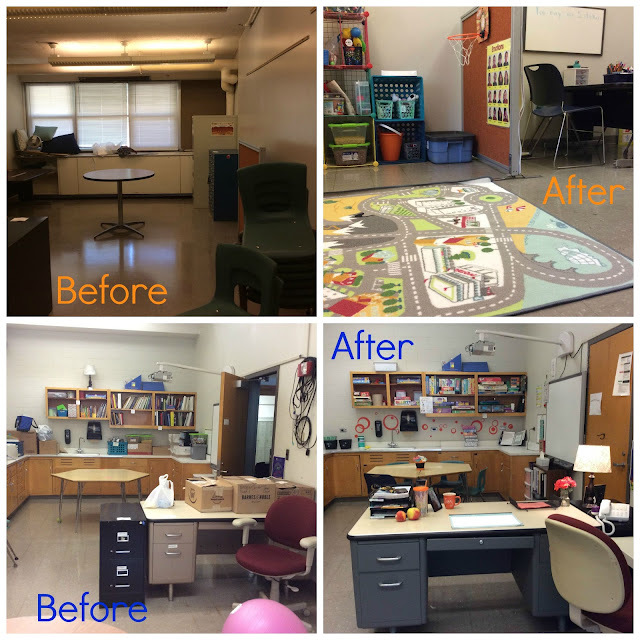 Below are 2 before/after shots of my classroom. It started off pretty barren as I didn't have many pieces of furniture moving from my storage closet. The overall theme I chose for the room was gray with orange accents and some flair from Pixar's Inside Out. My favorite color is orange and so I send home everything on orange paper. 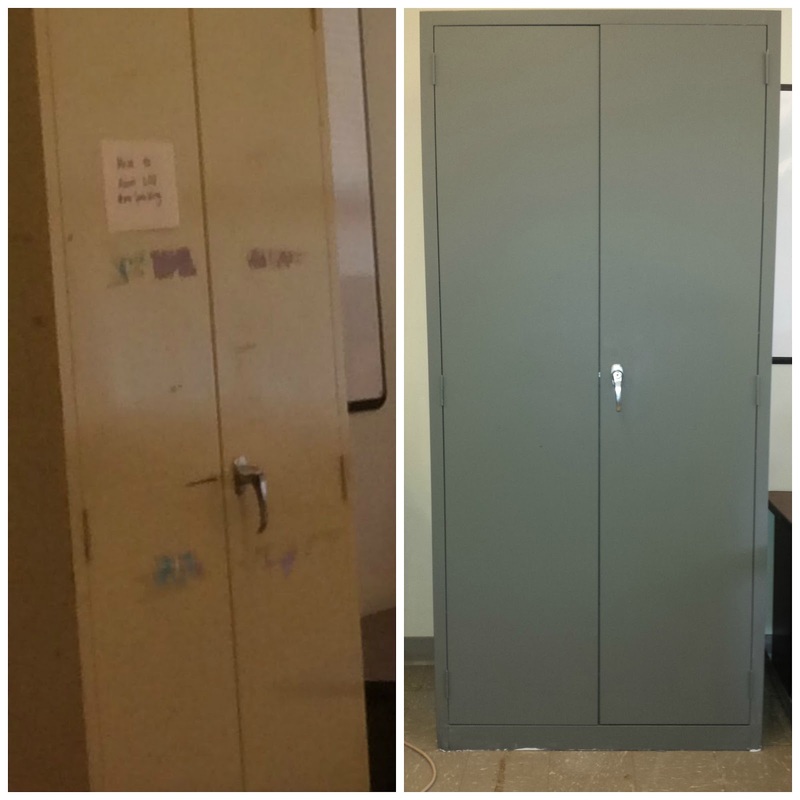 I painted some of the metal furniture gray so that it would coordinate and be less of an eye sore. One thing that I picked up from other bloggers is how to organize a room. I tried to split my room into different zones. The first zone is in front of the smart board and I plan to use it for my instructional home base, particularly for my older students. The zone is surrounded by wonderful cabinets filled with my favorite therapy supplies and all my board games. I hope to get curtains to cover up the games and calm down the space. The second zone is my work space. 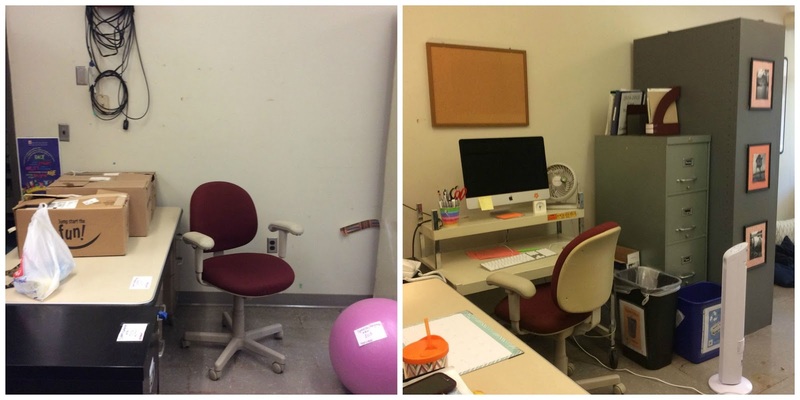 I wanted my desk to face the door so that I could see anyone who enters and also see into the hallway. The final zone is my individual or small group space. I have a smaller, shorter desk that I plan to use with my younger students. Behind the small work table is a play therapy area. I found a great car mat at Ikea for $20 and I just know it will be a hit. When students enter, they can pick up their brand new folder out of the milk crate. Because I have 9 grades that I work with, I've found that a milk crate is really the best folder system for me. The middle picture shows my organization for focusing on vocabulary. I have a easy-to-grab bucket for high stakes testing vocabulary for the upper and lower grades (courtesy of Natalie Snyders) and a bin for my prefixes/roots/suffixes vocabulary. 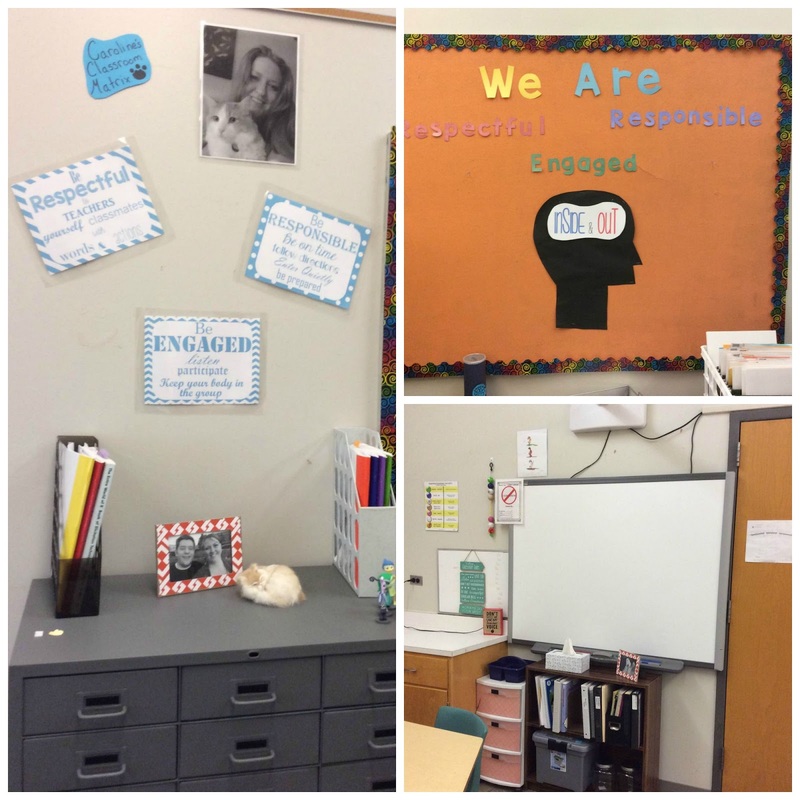 Keeping classroom rules and visuals next to the smart board was a must. I was able to re-do my desk area and have a working desk along with a computer part. This is definitely not the prettiest part of the room, but it functions extremely well. There were 2-3 layers of labels on these drawers. This room has been used for FACs, a testing room, and a special education room. Goo-gone was my friend when removing these labels. Because I change my mind all the time, I went with chalkboard labels so that I can move materials around and label them as many times as I want. Does your school use PBIS? I included our PBIS phrases in my visual classroom matrix (left) and on an Inside Out themed bulletin board. I plan to have students pick one word that is a positive attribute and add it to the bulletin board (We are... strong, smart, funny, etc.). Below my smart board is a bookshelf I brought in from home. This is fantastic as I have put all my resources that I use on a daily basis here. On the shelf are my quick artic activities, social skills lessons, and some language materials. I hope you enjoyed a tour of my speech room. I am in love with it and can't wait to see the kids' reactions! With my excitment over not only staying in the same school for the second year, but also getting a bigger room that functions for me, I started projects early this year. This summer, I decided to take the time off and focus on things such as cleaning, cooking, blogging, and creating materials. 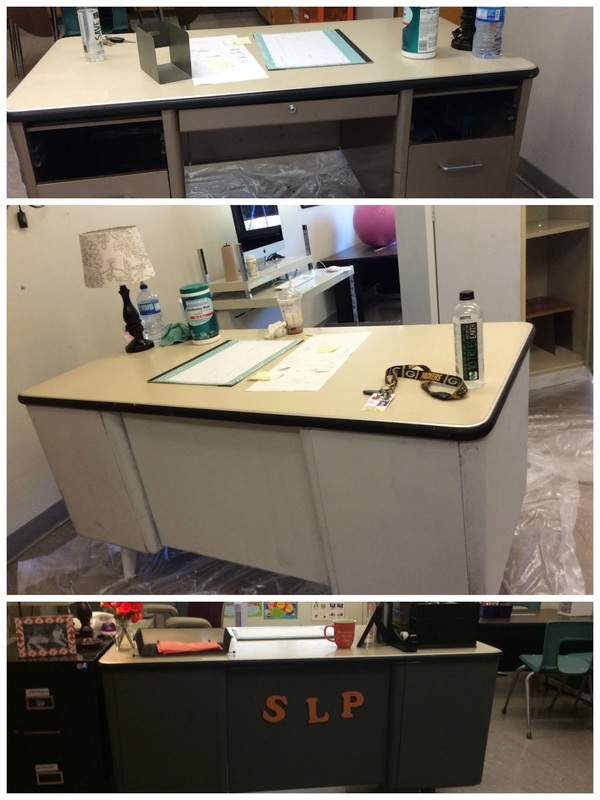 Sooo, when I found myself on Pinterest looking up classroom makeovers, I said to myself, "Huh, I could do that! It'd be easy." Ha... well, the good news is that I did it. I also learned quite alot about DIY projects. I started with what I thought was a simple paint job. 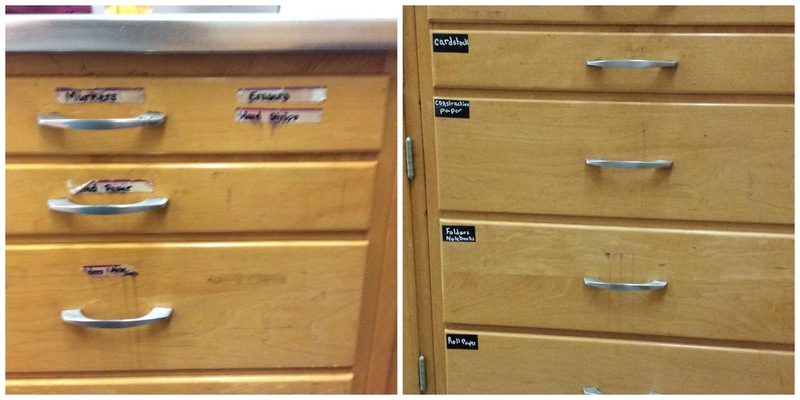 I walked into my new classroom and found that my desk and a huge metal cabinet were rusty and in very rough shape. 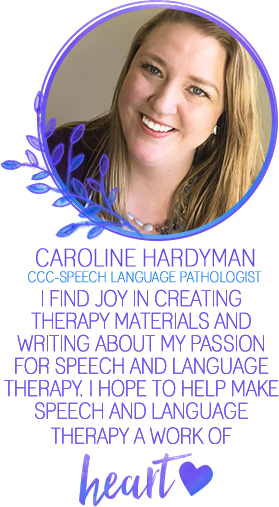 I enjoy pretty things and decided to follow the lead of some bloggers I follow (AKA Natalie Snyders and The Speech Bubble). My hands have not lifted a paintbrush since I was 14, but I braved the process. The workers at Home Depot and Ace Hardware were so wonderful and patiently explained what paint would be best and waited for me to decide which colors I wanted. Since my pieces had already started to rust, I followed recommendations and applied a coat of primer followed by 2 coats of my chosen paint. Here are a few things I learned. 1) There is alot of surface area on a desk to paint. I ended up having to buy a bigger paint roller and paint brush than I thought I needed. Having the larger roll made it so much easier and the job went much quicker. 2) Having a sink in the room where you are painting is amazing! However, it hadn't been used in over two months, so when I turned it on to rinse my brushes and rollers, air from the pipes made water and paint spray EVERYWHERE. 3) When I primed the furniture, at first I was trying to get every little spot. I was disappointed with my primer job because the old metal still showed through the white a little bit, but then I realized that I was not painting the desk white. Reminding myself to not be a perfectionist was important. 4) I HATE Scotch tape. On both the desk and the cabinet, I found dozens of pieces of scotch tape from years of attaching important information. The masking tape was easily removed with goo gone, but the scotch tape did not respond to the goo gone. I thought about using a putty knife, but I didn't have one and I didn't want the metal to scratch up the surface. So, instead I used my nails to peel off every piece I could find. Turns out they make plastic putty knives, wish I had known that from the get go. But! even after all my hunting, I found MORE scotch tape after I started priming. Ugh. I am never using scotch tape on furniture again. Masking tape, maybe. In the end, I had extra primer and paint and was able to paint one more storage pieces to match. No more mismatched school hand-me-downs, whoop whoop!